Are you running a 64-bit OS? What is the exact error youa re getting? Makes sence. The exe could not find the OS files it needed so no go. I think it is 64 bit 4 gig computer. I looked in the folder and there is no files for galciv 3 at all. just for direct x. using window seven withsecurity turned off. That's typical if you are not running 64-bit. I'd verify that first. You should right click on "computer" from the start menu and select properties. Then find "system type" It should say 64-bit operating system. Yep, you are going to need to upgrade your computer to 64 bit. Glad to see you're back Danielost, its been years, no? Banned for not updating your avatar. DARCA - Banned for Double posting! I would like to repeat, and emphasize, a previous request I made to have GC3 report in a window before going down any time it is started on a system that does not meet the minimum operating criteria. A 32bit operating system is certainly one case of many. Knowing why it won't run on one's system is much better than having someone screaming and cussing about how bad your product is. He doesn't have to upgrade his computer, just his OS. Computer hardware has been 64 bit for a long time now. Better yet, in this case, would be a warning when someone is trying to actually install it that the OS doesn't meet the requirements. No point in spending the time trying to put it on your system in the first place if it's not going to work. Better yet would be a check by Steam to see if you have the pre-reqs or not before you paid for it. 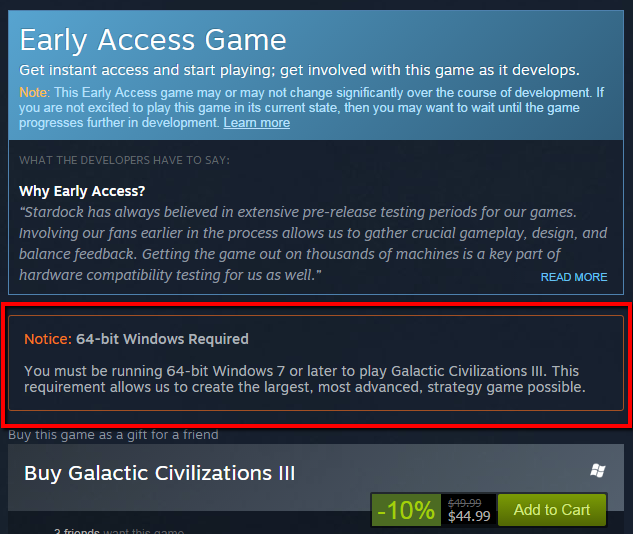 But then, that would be a requirement on Steam, and can anyone get them to implement it? Better yet would be users who are aware of what they are purchasing, and not quite the universal reliance on it being someone else's fault for every mistake made. This is the kind of mind set that leads to safety warnings not to use a hot iron on the clothes you are presently wearing. Better yet have a game that will scan you system then adjust itself to make full use of all your hardware. Or the opposite scale itself down for you. I would like to get what I paid for in computing. Better yet one karma to the next person that starts their post with "better yet"! really, the neeaxt person...and one can wish to reward me as well. This is all we can do on Steam to display 64bit is required. I wasn't blaming just asking. I thought I had the requirements needed to run the game. BETTER YET, it would have been nice to have been notified that the file hadn't completed the download. Congratulations on winning the playerless*! :/ Competition! Better Yet, if someone planning to purchase new games/programs actually checked if their comp ticks all the requirements before purchasing it?